Get your Diploma in 1 year! The 1070-hour Shiatsupractor Diploma Program is designed for 1 year full-time or 2 years part-time. 1070 hours of program includes classes such as Health Science, introduction of TCM, Shiatsu Manual Skills and also clinical placement hours as clinical experience. Students learn not only the basic but advanced Shiatsu skill. They perform Shiatsu for 200 clients at the student clinic and attend community events as field work. Through these experiences, they have a great chance to work as professional Shiatsu therapist at the clinics. Upon successful completion of this program, the student can apply the Canadian Shiatsu Society of BC for Shiatsu Therapist status. *Shiatsu – 8 weeks Shiatsu Foundation class, 8 weeks Advanced Shiatsu class. School Clinic will be started after the completion of Shiatsu Foundation. *Shiatsu – 16 weeks Shiatsu Foundation class, 16 weeks Advanced Shiatsu class. A mastery of the fundamentals of the structure and function of the body underlies the development of effective treatment for Shiatsu therapy. Teaching method is lecture format. The emphasis is on regional and functional anatomy. The course involves terminology, function and action of all organ systems. This course provides detailed knowledge of the functional organization and operational mechanisms employed by cells, tissues, organs and systems. This area provides the basic technique of Shiatsu treatment and advanced techniques for pathological conditions including Tsubo Shiatsu. Teaching methods are lecture and practical format. Learning self-administered Shiatsu teaches the student basic use of the hands, correct selection of pressure application methods and all the basic pressure points. Practicing self-Shiatsu can be part of a preventative and health-conditioning program. In this segment, the student learns 10-minute chair Shiatsu treatment as well as 20-minute chair Shiatsu treatment, and practices on each other in the class. This is the first time for students to practice Shiatsu on someone other than themselves. The basic full-body treatment, which takes 75 to 90 minutes to complete, and includes up to 660 points, is learned and practiced. The full-body treatment is taught in stages, gradually increasing the duration of time until the complete treatment is mastered. The underlying theory of the Tsubo, or pathological reflex point is discussed including the pain relieving aspects of Shiatsu. Treatments for conditions of the circulatory, nervous, digestive, respiratory, endocrine, musculoskeletal, urinary and reproductive systems are studied and practiced. This area provides the introduction of basic therapy and foundation of TCM. understand and apply diagnosis and treatment theories to Shiatsu and other medical practice. This area provides clinical experience with the public. This segment focuses completely on clinical placement studies. (Prerequisites: the completion of the Shiatsu Foundation course, passing grade in clinic entrance written examination and assessment of the full-body treatment). This clinical placement is mandatory and essential for the student to complete our programs. 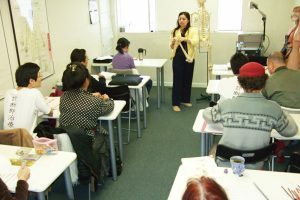 They develop skills in taking medical history, treatment planning and Shiatsu techniques. Students practice at the CCST treating 200 patients under supervision. 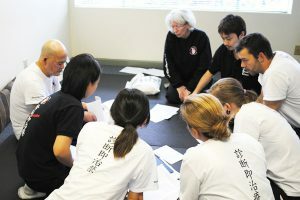 Students have to pass the Shiatsu assessment step by step, and also study while they don’t have clients. Students practice at the CCST and at public events to treat patients under supervision. The Program has a minimum and a maximum student enrolment in order to ensure ample individual instruction when required. e) Read and understand the School Policy and mission statement. f ) The Student and the School’s Representative (Signing Officer) sign the Enrolment Contract. g) International students wishing to apply to study at the Canadian College of Shiatsu Therapy must apply for a student visa from Citizenship and Immigration Canada. The Diploma program at the college qualifies for foreign student authorization as an accredited institution under the Private Training Institution Branch.